Dry extended detention basins are designed to dry out between storm events, in contrast with wet ponds, which contain standing water permanently. As such, they are similar in construction and function to dry detention basins, except that the duration of detention of stormwater is designed to be longer, theoretically improving treatment effectiveness. Dry extended detention basins can provide flood control, channel protection and some pollutant removal. In general, dry extended detention ponds should be used at sites with a minimum drainage area of 10 acres. On smaller sites, it may be difficult to provide channel or water quality control because the orifice diameter at the outlet becomes very small, and is thus prone to clogging. In addition, it is generally more cost-effective to control larger drainage areas due to the economies of scale in pond construction. Widely used in suburban residential developments. Some see these structures as mosquito breeding nuisances. This practice is typically funded by project developers. Clean and remove debris from inlet and outlet structures. Mow side slopes (embankment) and maintenance access. Periodic mowing is only required along maintenance rights-of-way and the embankment. Remove vegetation that may hinder the operation of the pond. Several design features can ease the maintenance burden associated with a practice. In dry extended detention ponds, a “micro pool” at the outlet can prevent resuspension of sediment and outlet clogging. A good design also includes maintenance access to the forebay and micro pool. Specific pond designs may vary considerably, depending on site constraints or preferences of the designer or community. There are some features, however, that should be incorporated into most dry extended detention pond designs. These design features can be divided into five basic categories: pretreatment, treatment, conveyance, maintenance reduction and landscaping. 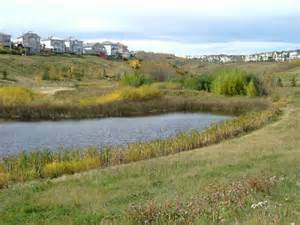 While wet ponds can increase property values, dry ponds can detract from the value of a home. Dry extended detention ponds have only moderate pollutant removal when compared to other structural stormwater practices, and are ineffective at removing soluble pollutants. In many situations, this practice is combined in a treatment train with other BMPs. Description: Templeville developed a construction ready design to restore and protect the Town’s park that features a storm water pond and recreational space. This project is located in the Upper Choptank River Watershed, in the Templeville Community Park. The main objectives of this project are restoration and protection of the pond and its environment, retrofit to address stormwater and rebuilding of park amenities. The grant funded engineering design to ensure that this watershed restoration project contributes to the achievement of local WIPs and, by extension, to restoration of the Chesapeake Bay system. Description: To mitigate and treat stormwater runoff around sports fields and school campus, an old stormwater pond was updated to reduce pollution delivered to a nearby stream.